Ahmad Fatemi of Mission Free Iran gives an interview to media at the 20 June action for International Day in Support of Political Prisoners in Iran in New York City in front of the UN. 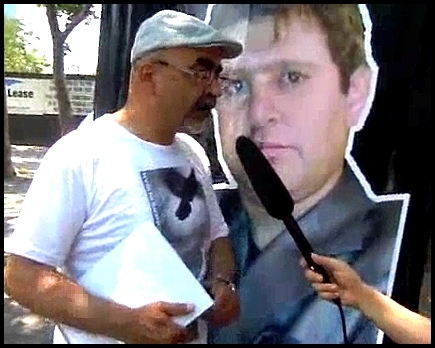 He later delivered MFI’s statement marking the occasion of 20 June. The image behind Mr. Fatemi is that of Houtan Kian, the lawyer of Sakineh Ashtiani — he helped to raise global support to stop her execution by stoning, but is now detained as a politicalprisoner under brutal torture — and has been for the past 21 months. It has been a year since we, many of us in this crowd, stood here on this same day in solidarity with and support for our fellow human beings chained in the dungeons of the guardians of Islam, the Islamic regime of Iran. Things have changed all around us since then. We have other combatants for freedom and humanity among us. We are witnessing a change of attitude of global dimensions in the social arena, bringing with itself change in the political scene. In the community of humanity, we see a shift towards the left in France, in Spain, in Greece – we even see an attempt by the US administration to follow suit, trying hard to cling to the remaining illusions of the grassroots of the awakening masses demanding justice and social and political fairness. We today see that the magnificent 99% is becoming a global reality and an institution, although young and immature, yet vibrant and vital. We see the zealousness of the Egyptian women and men in their continued revolution against the guardians of the old dictatorship, and against those vying to become the new dictators of the people of the “red line” revolution of human dignity, bread and liberties. We see today the Islamic regime is even less capable than ever of managing society. We see the snake eating its own tail, and if this ridiculous gang of murderers and rapists and pickpockets dictate their savage rule of madness to 90 million Iranians, it is only made possible by the noose of the gallows, the barrels of rifles, by Evin and Kahrizak. This is why we have gathered here, and this is why we must continue our support for the struggle of the political prisoners. This is why we need to gather momentum and become a force demanding freedom of all political prisoners – which is a demand for freedom itself. In the face of the gallows and guns and Evin and Kahrizak, we gather on this day to amplify the voices of our detained, imprisoned, tortured, raped – our sisters and brothers, physically broken yet courageously fighting back, standing against brutality and inhumanity. We together in protest, inside and outside of Iran, inside and outside of the prisons of the regime, have forced the regime to retreat on many occasions. And a retreat of one inch by this regime from limiting our basic freedoms – like speech, gathering, belief, sexuality – will bring these barbarians that much closer to their demise, while establishing the grounds for a future Iran in which there are no political prisoners, there is no torture or persecution, and there are no limits to our freedoms. We said that there are new political winds blowing, from east to west, and from south to north. We see that the pressure from beneath, from the streets, is felt in the corridors of power in front of us [the UN]! If these owners of power decided to keep silent in the face of crimes of the Islamic regime against humanity, even betraying their own mandate — not only their moral but legal responsibilities — when the thugs of Ayatollah committed genocide… we are here to tell them – all those who covered and continue to cover up for the forces of darkness, those who legitimized and continue to legitimize the rapists and killers of our sisters and brothers – that we hold them responsible, too, for the crimes committed by those who have occupied our peoples’ office in that institution [the UN]. We have demanded and we continue to demand expulsion of the torturers and killers of our people from this institution. It should not be acceptable for anyone other than the real owners of the streets of Tunis, Cairo, Manama, Jedda, Damascus, and Tehran – the people, the 99%, the masses – to decide who represents them. Expel these murderers and cutthroats – they do not represent us!